As someone who doesn&apos;t like wasting food, I&apos;m always looking for ways to use leftover ingredients. I have a bag in my freezer and collect all the vegetable scraps and bones until it&apos;s enough to make a batch of bone broth. I also use leftover lemon peel to make home-made vinegar and use it as environmental-friendly, chemicals-free all-purpose citrus cleaner. But how about egg yolks and egg whites? Not all recipes require both and you may end up wondering what to do with them. 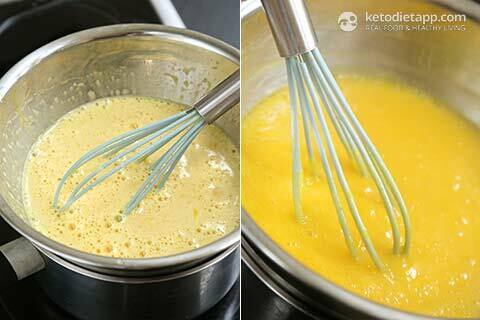 As long as you make sure that you store raw egg whites or egg yolks sealed in the fridge for no more than two days, they can be used in other recipes. Egg yolks don&apos;t freeze very well - they become too thick when frozen. However, there is a trick you can use if you plan to use them in a savoury recipe: simply add a pinch of salt (about 1/4 teaspoon per 8 egg yolks), beat in, seal well and freeze for up to 3 months. Yes, you can place egg whites in freezer bags and freeze in batches for up to 3 months. When ready to be used, defrost in the fridge overnight. Raspberry Meringue Pie (uses both egg whites & egg yolks) - or you can try Lemon Meringue Tartlets created exclusively for my upcoming cookbook! ... and then halve and juice them. In a bowl, mix the egg yolks with powdered erythritol and add stevia (if used for additional sweetness). 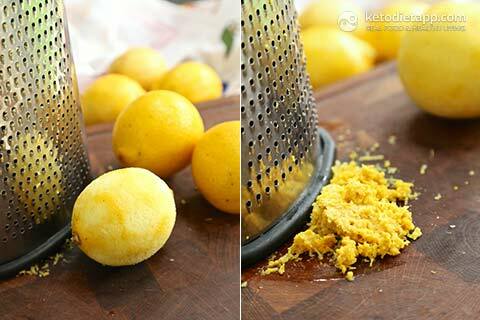 Pour in the lemon juice and add the lemon zest. Mix until well combined. Place the bowl over a saucepan filled with simmering water and stir constantly; make sure the water doesn’t touch the bottom of the bowl. 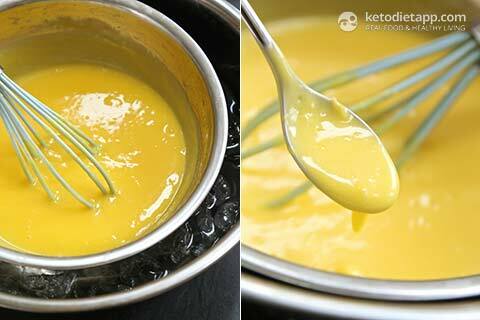 Keep stirring for 8-10 minutes or until the custard starts to thicken. Then take off the heat. If you are planning to use the curd in a pie, add the thickener mixed with water (arrowroot or gelatine). Add butter cut into small pieces and mix until melted and well combined. Don&apos;t worry if the curd is not smooth or looks scrambled. To fix it, you can use a blender or a food processor and pulse for just a few seconds. Place the bowl with the curd in a larger bowl filled with ice water (cold water with ice cubes) and mix until the curd is chilled. When done, place in an airtight jar and keep refrigerated for up to 10 days. 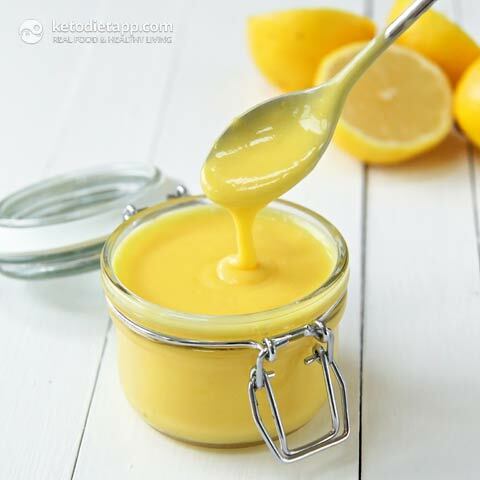 Lemon curd works great as a dip with grain-free crackers, poured over berries, as topping in parfaits such as Eton Mess or filling in pies (arrowroot or gelatine should be added for a firmer texture). Enjoy! 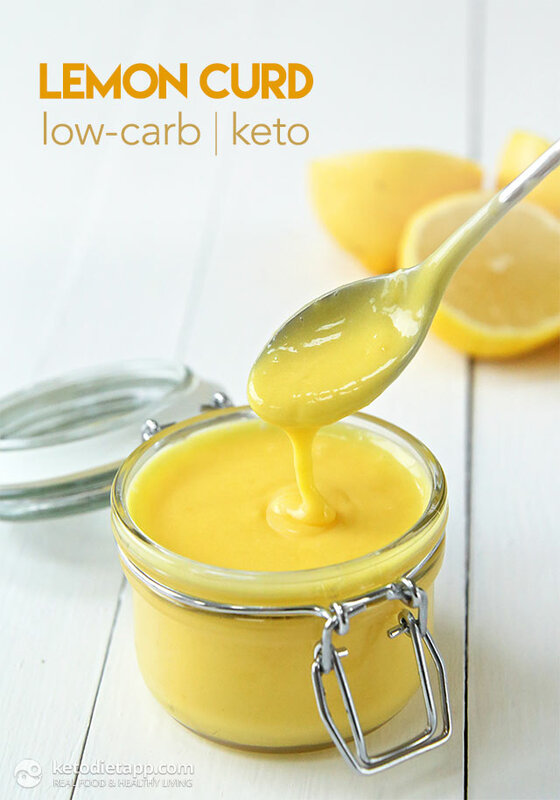 Low-Carb Lemon Curd is a great foundation, but was too strong and too jelled, with gelatin added. I will add a cup of water next time as well. This recipe needs experimenting with the freshness or staleness of your eggs, and do add at least a 1/2 cup of water. It would be good also, in small pastry tarts, as the lemon flavour is strong and the pastry in the tart shell would be a nice contrast. I made half to try it out. I used powdered monk fruit sweetener. The texture was great, nice and creamy. But it's quite sour. I was afraid to add liquid monk fruit because it tends to have an aftertaste. What would be better to sweeten it up. It also had a metallic taste. I suppose you could use more powdered erythritol or swerve. Or a few more drops of stevia. I like mine tart but you could make it less tart by using less lemon zest. Hi I have just found your site. 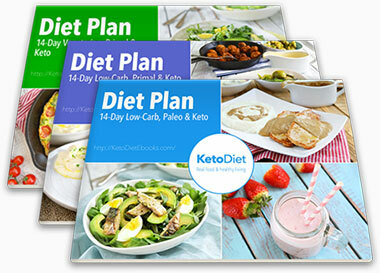 It's a brilliant help to expand and otherwise basic ketogenic diet. I have made the baguettes and want to try this to use up the egg yolks. My question is what size air tight container should I get to keep the curd (oh and the "nutella" and the mayo) in? It doesn't mention sizes of containers to keep it in. Thanks and I shall keep using your recipes. OMG!!!!! This is incredible! I'm making extra for my low carb friends for holiday gifts. FANTASTIC! I LOVE THIS! I made the Ultimate Keto Buns...PERFECT on the first try! I had the egg yolks left but only one lemon. So I got all the zest I possibly could, juiced it, boiled the rest of the lemon to get more juice and used lime juice. I also put in a few drops of lemon stevia and a little powdered stevia to sweeten it more. It's PERFECT! Thick and delicious. THANK YOU! Can this custard be frozen? I can't answer that as I haven't tried it but I did use it to make popsicles and it worked wonderfully. However, it may not work if you want to just freeze and defrost it. Thank you! I'm going to make this today after we made the Ultimate Keto bread yesterday and have egg yolks. 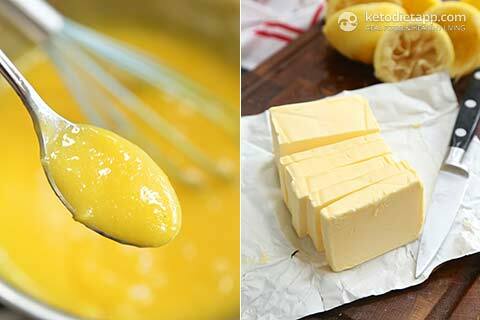 A convenient way to freeze and store extra egg yolk is to add the salt, mix then pour into one of those small fluted candy molds I have seen you use for fat bombs. One mold holds one yolk. After they freeze I remove the mold and keep frozen in an air tight container. 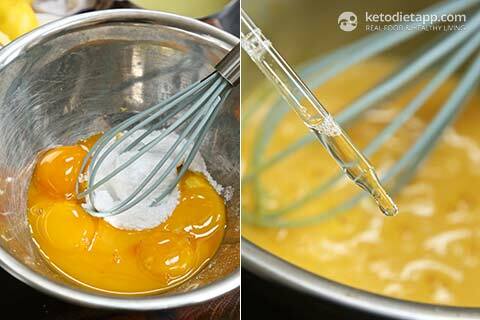 No need to guess how many yolks in a container, just pull them out as you need them. That's fantastic Jill, thanks for the tips! 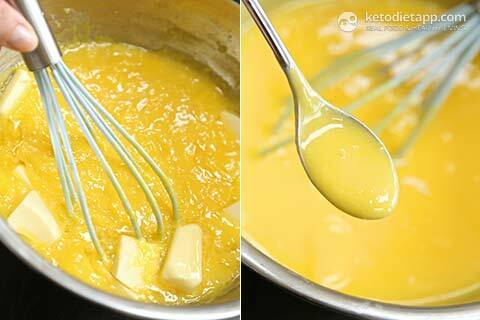 Lemon curd has been one of my very favorite treats for years. It is something I often gave as Christmas gifts. I swore off refined carbs about two months ago, so it's exciting that I can still enjoy lemon curd. This is so yummy. Thank you for the recipe. So so delicious ❤  Thanks for the great recipe! I JUST started eating "the Keto Way" to kick off the new year. I made the Buns this morning, EXCELLENT! ", and saw this little recipe. GREAT Idea! 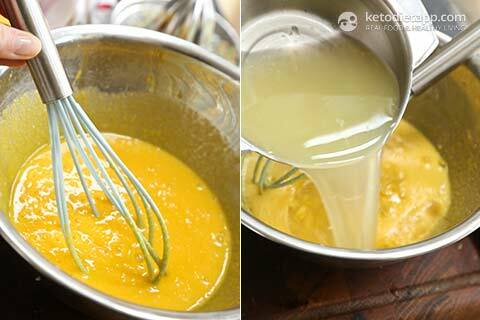 I never even thought to make Lemon Curd, which I LOVE, thinking it was too fattening to eat. I'm really LIKING this new way of eating! About citrus - the zest in particular. I read something somewhere (cant remember where) about the pericarp sometimes carrying some sort of pathogen (along with the usual problems of pesticide). Do you know anything about this? 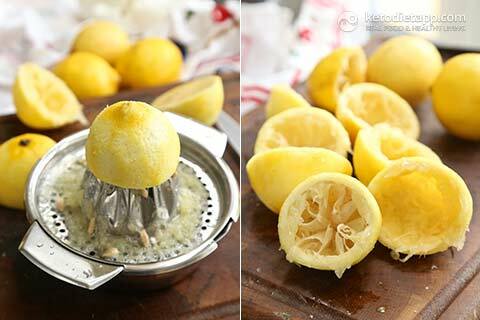 I'm wondering if there is a safe way to wash the lemons? Somehow I don't think washing under the tap would be adequate. Getting organic lemons where I live in Australia is nearly impossible. But I love the idea of using the whole of the fruit. I use the insides and I get my bioflavanoids fron the white layer. Currently I throw the zest away. I've been using pure essential lemon oil instead of using zest because I have plenty of other stuff to worry about. But any advice or even pointers to places for information would be so appreciated. (please). I would really like to make this old favourite. Thank you Rowan, I really appreciate that! Sorry for the late reply, it takes time to go through all my comments on a regular basis  I haven't heard of this issue but I always get organic unwaxed lemons and wash them properly before using. I think that "non-organic" lemons will be an issue even if you wash them. The pesticides may not be in the fruit but will still be in the peel. I haven't tried essential oil to make this recipe but that actually sounds like a great alternative if you can't find organic lemons. Hope it works - let me know if you try it! This looks great! My Mom loves lemon curd but doesn't like the taste of Erythritol very much. Do you think granulated Splenda would work in this recipe if we powdered it? I imagine it would be sweeter than an equal volume of erythritol, but we could just not add the liquid sweetener. Made this with lemons and limes and it's fantastic! Smooth, creamy and not too sweet (I skipped the stevia). Thumbs up!